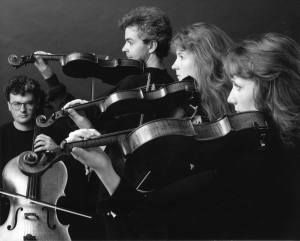 Formé en 1992, l’Emperor String Quartet est le premier quatuor anglais à avoir remporté le Concours International de Quatuor à Codes d’Evian en 1995. Ce prix lui a valu des invitations à Paris, Vienne et New York et le Quatuor dans sa formation d’origine est maintenant l’un des ensembles les plus demandés en Grande Bretagne.Depuis sa formation ils y a 10 ans, le Quatuor Emperor a fait des tournées en Amérique du Nord et du Sud et a été invité par d’importants festivals internationaux tels que Prague, Edinburgh, Mostly Mozart ainsi que par tous les plus importants festivals en Grande Bretagne.Récemment, le Quatuor a beaucoup tourné en Ecosse et en Allemagne, a donné des concerts au Nigeria pour le British Council. Ils continue à développer leur programme éducatif, apportant la musique classique dans les écoles primaires et secondaires, essentiellement sous les auspices de la Fondation Cavatina pour la Musique de Chambre. Pour son 10 ème anniversaire le Quatuor retourne aux Etats Unis, en Italie, en France et en Tchécoslovaquie et donne de nombreux concerts à travers la Grande Bretagne.Le Quatuor Emperor a enregistré les quatuors de MacMillan à paraître pour le label suédois « BIS » et les deux quatuors de Walton pour Black Box qui a reçu un accueil extrêmement chaleureux de la presse et qui vient juste d’être nominé en catégorie de musique de Chambre pour le très convoité « Grammy Award ». Leurs projets d’enregistrement comprennent entre autre l’intégrale des quatuors à cordes de Martinu et Britten pour le label suédois « BIS ». The Emperor String Quartet was formed in 1992. The following year the Quartet won several prizes: South East Arts "Young Concert Artists Platform", giving them concerts throughout Southern England; The Tunnel Prize, which introduced them to audiences in Scotland and the Edward Boyle Prize, which gave them their debut at the Wigmore Hall. In 1994 they were awarded the Menuhin Prize at the London String Quartet Competition and in 1995 they won First Prize, Mozart Prize and Contemporary Music Prize at the prestigious Evian/Bordeaux International String Quartet Competition, thereby introducing them to audiences in Europe. The Quartet made their debut at the Edinburgh International Festival in 1994 and were re-invited the following year, they have played at Cheltenham, Bath, Brighton, City of London, Cambridge, St Magnus, Harrogate, Kings, Lynn, Bury, Swaledale, Grassington, Lincoln, Bury, Winchester, Salisbury and many more. They have played at all of the major concert halls in the UK and abroad have played at festivals such as Prague Spring, Reims, Monte Carlo, Radio France/Montpelier, Paris, Evian, Martinu Festival (Czech Republic), Basle, Vienna, Kuhmo, Lapland, Flanders, Hambach and Mostly Mozart (New York City). The Quartet have toured throughout Europe, North America and have toured for the British council in Nigeria and Ecuador. They have collaborated with artists such as Julian Bream, Stephen Bishop, Philip Langridge, Ian Bostridge, Michael Collins, Emma Johnson, Anya Alexeev, Paul Lewis and Leon McCawley as well as with the Endellion, Belcea, Maggini and Mandelring String Quartets. The Emperor Quartet enjoy a varied repertoire. They have taken part in Haydn and Beethoven cycles in London, Edinburgh and New York and have played works by Xenakis, Harrison Birtwistle and Ligeti for major contemporary concert series. They have participated in New Music Workshops for the Society for the Promotion of New Music and Edinburgh Contemporary Arts Trust and have premiered numerous works by talented composers of their generation such as Ian Wilson, Rebecca Saunders, James Macmillan, John Woolrich and Philip Cashian. The Quartet have broadcast for radio and television in France, Italy, Germany, Belgium, Holland, Switzerland, Czech Republic, USA, Finland and Sweden. They have been BBC artists since 1993 and have made studio recordings, live broadcasts from the Wigmore and Bridgewater Halls as well as venues around the country. They have recorded a number of programmes in the BBC Radio 3 "Discovering Music" series and were invited to give the BBC William Walton Centenary concert in 2001. Their CD recording of Walton was nominated for a Grammy award in 2002 since which they have made a number of highly acclaimed recordings for the Swedish label, Bis, the latest project being a complete cycle of the Britten Quartets which will include previously unrecorded works. They have recorded Elgar’s “Introduction and Allegro” with the Royal Philharmonic Orchestra and have made guest appearances on albums for Barbara Dickson, Troy Donockley and Radiohead's Jonny Greenwood. The Quartet can be heard on Greenwood's score for the Daniel Day Lewis film: "There Will Be Blood"
In their early years the Quartet participated in the "Live Music Now" scheme, playing concerts in a wide variety of community venues. They were Quartet in Residence at Royal Holloway University from 1994-1999 and are now linked with the Royal Welsh College of Music and Drama in Cardiff. As well as chamber music coaching they run a busy programme of workshops and interactive concerts aimed at students of all ages and they are supported in this by the Cavatina Chamber Music Trust, First Campus and by Societies around the country.